It seems not all that long ago that most of us had little idea about our exact locations on the planet the majority of our days. Many of us who used to be content wandering city streets, now instead poke away at our IPhones for constant direction and advice. It is nearly impossible to navigate an automobile any more without an automated voice correcting your every move, dryly informing you just how much time you’ve wasted by taking a wrong turn, or, god forbid, making an unscheduled pit stop. It all seems a bit silly sometimes, doesn’t it? For my first 5-in-5 project, I decided to start working on a project I’ve had kicking around in the back of my head for sometime; A completely random, spin the bottle, form of guidance system that will never, ever, get you to your destination on time, or even on purpose. The Free.P.S. 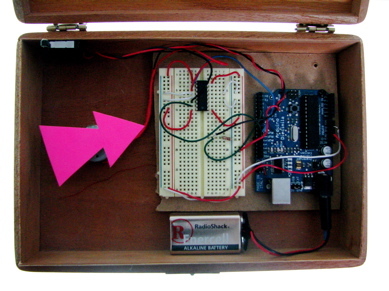 System is quite simple, consisting of an Arduino, an H-bridge, a switch, and an arrow attached to a small motor. 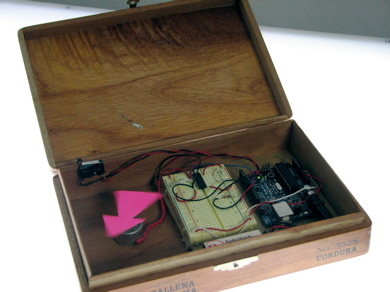 When the user opens the cigar box, the arrow is triggered to spin at various speeds, changing direction every now and then. After a random amount of time, the arrow stops, and the user heads in the general direction that the unit suggests. When the user hits a dead end, or decides that they need to reconsider where they’re heading, they simply open the box and repeat the process. Take a look at the Free.P.S. Unit in action below. This is a rough prototype, and it isn’t working exactly as I had planned, but you get the idea. I would really like to make this pocket/keychain sized, or incorporate an actual compass of sorts in the future. © NYU ITP 4-in-4 » Free.P.S. (Freedom from Positioning Systems) 2010, All Rights Reserved.